To find discussion questions, proverbs, quotations, find someone who... questions, etc. 4) use the JMatch or JCloze keys to create an interactive web-based exercise. 2. When the word appears, choose the sentence you wish to use by clicking on it. 3. Click on the Use button below the sentences window, to put the sentence into the output screen. Again, click in the WORDS column on the left side of the screen and type in the next word you want. After you have chosen the sentence you want for the word you have selected, always remember to first click the cursor back into the WORDS column, and then, again, type the next word you want. 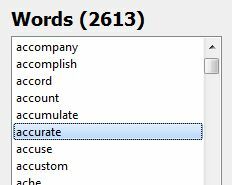 Note: Don't use the button marked "+ New Word" to locate a word. This button is used to add a new word to the database which is not already included in the program. (See step D below). Continue the same procedure until you have all the sentences you need. Check of the box Include word list if you want to words to be offered as clues for the exercise. You are now ready to produce your vocabulary exercise - follow the instruction in B below to produce an exercise in the form of a paper document, C to insert a gap-fill exercise into a pre-existing document, or D to create for an interactive web-based exercise. The following screenshot shows the principle features of the program. Click on the Clipboard button. 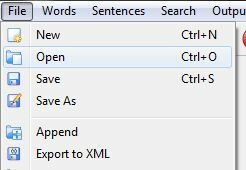 Open the document in which you wish to insert the gapfill exercise and select edit / paste from the document file menu. Click on the RTF (rich text format) button. Give a name to the exercise and click on Save. Click on Yes to open the file. In order to do this, you must have the Hot Potatoes suite installed on your computer. Hot Potatoes is freeware and can be obtained by downloading it from their website. Click on the button that reads JMatch or JCloze. Give a title to the exercise and click on the save icon. To open the exercise, go to file / create web page / make your selection. Click on the New Word button below the WORDS column. Type the new word into the box and click OK. In the Words column, click on the word that you want to add a sentence for. Click on the New Sentence button. 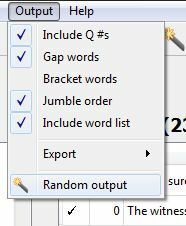 Type the new sentence into the box, using square [brackets] for the target word and click OK.
Click on Sentences in the menu bar at the top of the program. Click on the random output button . Select the options available as appropriate. You can also produce this type of exercise by going to output in the menu and choosing random output. 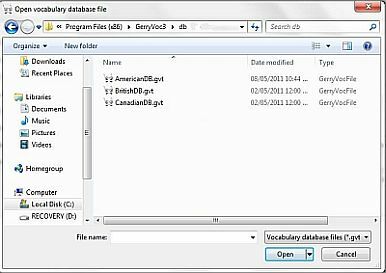 In order to access different database files, including the American, British or Canadian English files, click on the file option at the top of the program interface and select Open. Next, click on db in order to see the different files available. Finally, select the database file you wish to use. Repeat the above process to work variously with the different files. If you cannot find these files, you have probably been taken to the wrong folder. Go to Program Files on your C: drive, and find the folder entitled GerryVoc. The buttons marked delete, edit, and clear are for deleting sentences or words, editing sentences, and clearing the output box of all sentences. L. To find discussion questions, proverbs, quotations, "find someone who..." questions, etc. All the discussion questions, proverbs, etc. are located within the entry for the given keyword. They are usually among the last sentences listed in the keyword collection of sentences. Just move down through the list of sentences by using the scroll button to find them.